A selection of cute and useful Easter motif items to set a pretty table or to give as a gift. These items make a great gift that will be remembered year after year. Egg topiary in a pink or blue vase with pastel colored shimmering eggs. Easter egg shaped plate decorated with pretty pastel dots and flowers. Very cute green bunny with lettuce and carrots decorate a four cup teapot with strainer. Cream colored Easter egg holder with a bunny holding a flower in the center. Add a touch of Easter whimsy to your decor with this adorable bunny shaped egg plate. A cabbage shaped plate and bowl with an adorable little bunny and carrot. Grapevine garland with ivy, berries, eggs and birds nest with speckled eggs in them. 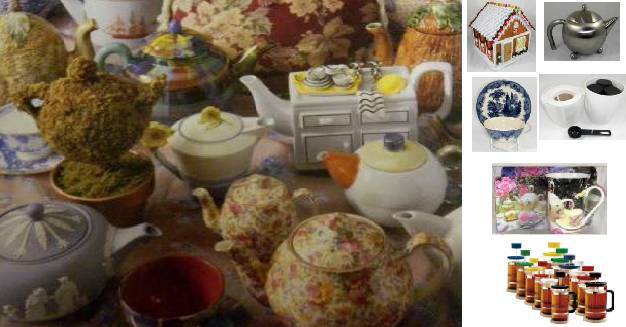 Adorable tea set with a 12 ounce teapot and two cups and saucers. A cabbage shaped devil egg plate with bunny salt and pepper shakers.